And when you are in a seated position, you are reaching far more often and increasing the risk of injury. So if you are a wheelchair user it is possible that using the shoulder joint and muscles beyond the intended demand is unavoidable. Pain is exacerbated by muscular imbalances. If you spend all day pushing your wheelchair and lifting to transfer your body, it is clear that all the muscles used to push are getting stronger. Muscles can also get tight. These muscles attach to the shoulder blade, and pull it forward as they shorten. The joint space between the humerus and shoulder blade is small. This joint space is where the tendons of the rotator cuff, the nerves to the arm, and blood vessels pass. The smaller space means that all of these structures are rubbing against each other and as well as the bone. Keeping that joint space as big as possible will decrease pain. Stretching the muscles used for pushing every day is crucial! Stretch your pecs and open the chest! It’s also important to stretch the biceps – even those these are pulling muscles, they attach to that shoulder blade and get tight and short. 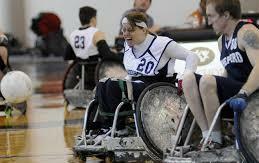 This is a very serious topics since I have been playing wheelchair sports for over 20 years. One thing that also needs to be mentioned is the importance of diet. Also, I would suggests Aquatic message therapy in either the offseason or as supplement to exercising for wheelchair users. Aquatic message therapy is the best exercises with the less stress to muscles since it takes gravity out of the equation.